Do Smoke Detectors Really Save Lives? Smoke kills! Most fatal home fires occur at night, while people are asleep. Poisonous gases and smoke from a fire can numb the senses in a very short time leaving you totally unaware that there is even a fire in your home. It’s a fact that death in a house fire is usually the result of the smoke, not the flames. Every home needs a device that can wake people up in time to escape from a fire. Of all the low-cost fire alarm devices you can buy, the Fire Service considers smoke detectors to be the most effective. 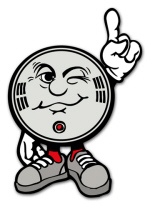 There are dozens of reputable brands of smoke detectors readily available. No matter where you buy your detectors or what type they are, be sure to buy only ones carrying the mark of an organization that tests and evaluates products. Any labelled smoke detector offers protection – whether it’s powered by batteries or household current, whether it’s photoelectric or ionization device. Consumers also have the option of having their detectors monitored by an outside agency for a fee. Ionization smoke alarms monitor ‘ions,’ or electrically charged particles in the air. Air molecules in a sample chamber of ionization smoke alarms, are ‘ionized’ by a radioactive source. This allows a small electrical current flow. Smoke particles entering the sensing chamber change the electrical balance of the air. The greater the amount of smoke, the higher the electrical imbalance. When combustion particles enter the smoke alarm, they obstruct the flow of the current. An alarm is pre-programmed to sound when the current gets too low. Ionization smoke alarms respond first to fast flaming fires. A flaming fire devours combustibles extremely fast, spreads rapidly and generates considerable heat with little smoke. Ionization alarms are best suited for rooms, which contain highly combustible material. These types of material include cooking fat/grease, flammable liquids, newspaper, paint and, cleaning solutions. Photoelectronic alarms contain a light emitting diode (LED) which is adjusted to direct a narrow infrared light across the unit’s detection chamber. When smoke particles enter this chamber they interfere with the beam and scatter the light. A strategically placed photodiode monitors the amount of light scattered within the chamber. When a pre-set level of light strikes the photodiode, the alarm is activated. Photoelectronic smoke alarms respond first to slow smoldering fires. A smoldering fire generates large amounts of thick, black smoke with little heat and may smolder for hours before bursting into flames. Photoelectronic models are best suited for living rooms, bedrooms and kitchens. This is because these rooms often contain large pieces of furniture, such as sofas, chairs, mattresses, counter tops, etc. which will burn slowly and create more smoldering smoke than flames. Photoelectronic smoke alarms are also less prone to nuisance alarms in the kitchen area than ionization smoke alarms. The use of both ionization and photoelectronic smoke alarms will provide a home with maximum protection and an ample warning in the event of a fire. Be sure to follow the manufacturer’s recommendations for installation, testing and maintenance. This is very important. According to the accepted Standard on Household Fire Warning Equipment (NFPA 74), minimum protection requires smoke detectors outside each bedroom and on each additional story of the house. This includes the basement. For additional protection, the Fire Service recommends that you install detectors inside each bedroom, the dining room, furnace room, utility room and hallways. Since we recommend that your family sleeps with bedrooms doors closed (to keep any potential smoke out), it may be wise to install detectors inside the bedrooms, especially if you are a smoker. Detectors are also recommended for kitchens, attics (finished or unfinished) and garages. Be sure you can hear detectors from each bedroom. Where And How Should I Install My Smoke Detectors? 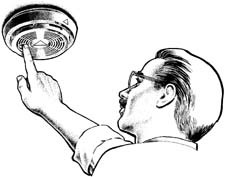 Most smoke detectors can be installed easily. Most operate either on batteries or household current. Detectors can also be hard-wired into the electrical system. But never hard-wire a detector to a circuit that can be turned off at a wall switch. Because smoke rises, each detector should be mounted high on a wall or on the ceiling to detect the first traces of smoke. For a wall-mounted unit, the top of the detector should be 4 to 12 inches from the ceiling. A ceiling-mounted detector should be placed at least 4 inches from any wall In a room with a high pitched ceiling, mount the detector on or near the ceiling’s highest point. Most home fires start in living areas – the den, family room or living room. On a floor with no bedrooms, install the required detector in or near the living area. If a stairway leads to an upper story, install the detector in the path where smoke would travel up the stairs. Don’t install a detector near a window, door or air register where drafts could reduce its sensitivity. Locate a basement smoke detector close to the stairway leading to the floor above. But don’t install the detector at the top of the basement stairs: dead air space near the door may prevent smoke from reaching the detector. Never paint a smoke detector. Because cobwebs and dust can impair a detector’s sensitivity, vacuum your detectors at least once a month to make sure you’re protected. What Happens When The Fire Alarm Sounds? Being awakened by a smoke detector can be a frightening and disorienting experience even for adults – so plan your escape before it an emergency. First of all, make sure everyone knows what your smoke detector sounds like. So test it in front of the entire family. Plan at least two ways out from each room – especially the bedrooms. Agree on a place to meet outside the house or apartment building so you’ll know when everyone is out. Have everyone rehearse the plan regularly. In case of a real fire, get out of the house immediately. Once everyone is out and gathered at a predetermined meeting place, have one person go to a neighbours phone to call the fire department by dialling 911. In addition to telling them your name and address, tell them if anyone is still in the house. Do not attempt to call the Fire Service from inside your home when it is on fire. Fire can spread very rapidly, trapping you inside. Fire safety In Your Home Starts Immediately! The combination of a family escape plan and properly installed and maintained smoke detectors can save lives in case of fire.